Emmanuel Macron reaches his headquarters in the Paris 15th arrondisement, pauses in front of chanting supporters, and for a moment the former banker whose whirlwind rise blew aside traditional parties seems lost for words - "Voila" he says. Macron thanks by name the minor candidates in the first round such as rural champion Jean Lassalle and quickly goes into second-round mode, broadening his offer and promising to represent all French people. In a further bid to appear presidential, Macron also looks beyond the second round and says he will seek to build a parliamentary majority "as soon as tomorrow". France's legislative elections take place on June 11-18, shortly after the May 7 presidential runoff. France's closest European partner Germany has unusually weighed in and made no bones about where its preferences lie for the second round, joined by European Commission President Jean-Claude Juncker who wished Macron well. (Neither may cut much ice with supporters of Marine Le Pen, who painted her campaign earlier as a "defence of the French nation," in a speech making no mention of Europe). 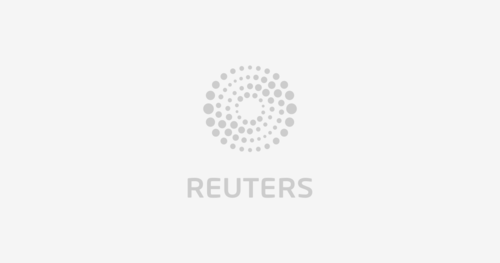 Reuters UKGerman Foreign Minister Sigmar Gabriel on Sunday welcomed the projected success of centrist Emmanuel Macron in the first round of the French election, saying he was sure Macron would become the next French president. That nearly wraps up the main events for this evening. We'll stay with you while our teams in Paris and the provinces finish wrapping up tonight's results and bringing you analysis for the second round. Meanwhile our reporters have not been idle while waiting for the candidates to make their victory/concession speeches. Mathieu Rosemain (@mrosemain) jotted down the play list at Macron headquarters, while supporters and media waited over two hours for his arrival. At the Marine Le Pen rally in Henin-Beaumont, northern France, it has been rock 'n' roll all evening, reports Matthias Blamont, with local mayor Steeve Briois taking his tie off and dancing to Arrows classic 'I Love Rock N Roll'. By contrast, Sarah White noticed a defiant but also bitter atmosphere at the HQ of defeated left-wing candidate Jean-Luc Melenchon, who refused to name a preferred candidate for the second round. Dozens of supporters remained outside late into the evening, singing chants of “Resistance, Resistance”. Centrist Emmanuel Macron took a big step towards the French presidency on Sunday by winning the first round of voting and qualifying for the May 7 runoff alongside far-right leader Marine Le Pen. Matthias Blamont catches the end of the party from the HQ of Marine Le Pen. Here is the link for the latest results from the Interior Ministry, but again, worth bearing in mind that major city results are likely to come in last. Macron is ahead for the first time this evening in the official vote count from the French government as late-closing urban ballots are included, falling more or less into line with projections from independent polling firms. With 40 million votes counted, Macron is on 23.54% and Le Pen on 22.33%, the interior ministry says. The choice facing French voters has become clear after the first round of the country’s presidential elections on Sunday. The pro-European reformer Emmanuel Macron will face the far-right protectionist Marine Le Pen in a runoff on May 7, projections showed. 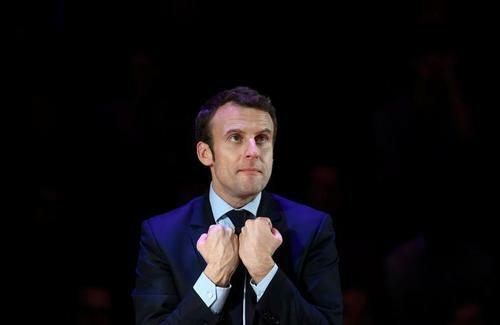 The independent centrist Macron is the clear favourite – a relief for investors who feared the rise of anti-EU candidates. His chances of victory are, however, better than his ability to deliver on promises of change. Reuters Breaking Views columnist Swaha Pattanaik considers a future for Emmanuel Macron. Read her full article here. 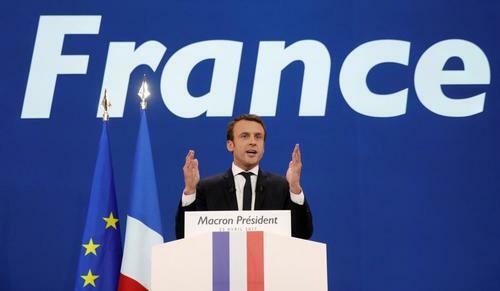 The euro surged in early trading in Asia while French bond yields were expected to fall and French stocks to rally on Monday morning,on relief that France had not been left with a choice between two radical, anti-EU presidential candidates. With 43.8 million out of the 47-million-strong electorate accounted for, the interior ministry says Emmanuel Macron is on 23.73% and Marine Le Pen on 21.85%. Conservative Francois Fillon is on 19.96%, left-wing contender Jean-Luc Melenchon on 19.25% and Socialist Benoit Hamon on 6.28%. Remaining candidates had a combined total of 8.92%. This is probably the most definitive result we will get this evening, with virtually all counting for the first round in France's presidential election complete. Final numbers will appear at some point overnight. Based on nearly complete figures, with 46 million out of the 47-million-strong electorate accounted for, the interior ministry said Emmanuel Macron was on 23.82 percent and Marine Le Pen on 21.58 percent. Conservative Francois Fillon was on 19.96 percent, left-wing contender Jean-Luc Melenchon on 19.49 percent and Socialist Benoit Hamon on 6.31 percent. Remaining candidates had 8.82 percent. 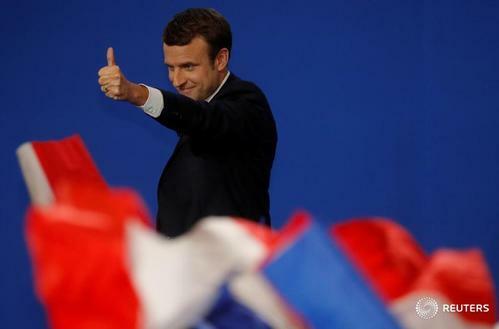 Emmanuel Macron's qualification for the runoff of France's presidential election in two weeks' time will certainly bring a sigh of relief in European capitals and financial markets; opinion polls suggest he will beat his far-right rival Marine Le Pen with ease. But to have a real chance of implementing the reform of France's economy and politics that he wants, he needs a victory big enough to enlist popular figures from established parties in the parliamentary election that follows in June. Thanks to the many people who followed our live French election coverage this evening. We wrap up with a final look at the triumph and tears that marked a night of French political theatre. And stay tuned for regular updates during the two-week campaign for the second round, followed by live coverage of the election of France's president on May 7. Flag-waving supporters cheered French centrist Emmanuel Macron and far-right leader Marine Le Pen's accession to the second round of France's presidential elections on Sunday night as downcast supporters of France's two main traditional parties quietly slipped out of their near-empty headquarters. Far-right French presidential candidate Le Pen says Macron is 'weak' in the face of Islamic terrorism, has no programme to defeat it. European shares opened sharply higher and the euro briefly vaulted to five-month peaks on Monday after the market's favored candidate won the first round of the French election, reducing the risk of another Brexit-like shock. French far-right presidential candidate Marine Le Pen launched a scathing attack against her centrist rival Emmanuel Macron, a day after the two were put through to a second round runoff on May 7, calling him "weak" in the face of Islamist terrorism. "I'm on the ground to meet the French people to draw their attention to important subjects, including Islamist terrorism to which the least we can say Mr Macron is weak on," Le Pen told reporters. "Mr Macron has no project to protect the French people in the face of Islamist dangers," she said, adding that the run-off with Macron was a referendum on "uncontrolled globalisation". 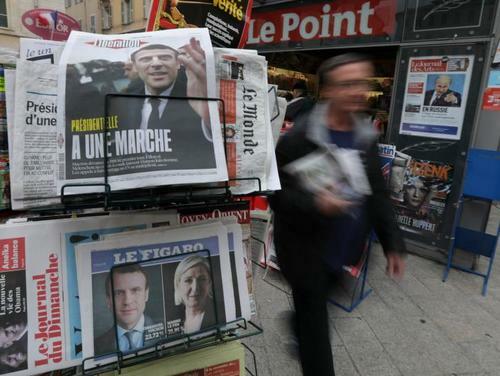 Our European Special Correspondent Noah Barkin takes a look at what Sunday's first-round result means for anti-establishment politics in Europe. The populist tsunami that slammed into Britain last year, before sweeping across the Atlantic to the United States, may have faded on the shores of France on Sunday. Shares of big U.S. banks up as European stocks rally after centrist Emmanuel Macron wins first voting round in France's presidential election. France's Hollande says the far-right is a risk for the country and calls on all voters to back Macron and block Le Pen. He says that France's place in the world is at stake in the second round of the election. 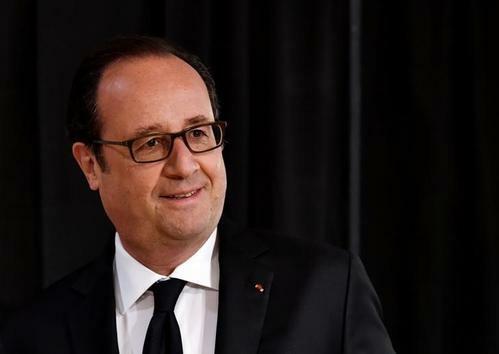 Reuters UKFrance's outgoing president, Francois Hollande, on Monday urged people to back centrist Emmanuel Macron in a vote to choose his successor next month and reject far-right leader Marine Le Pen, whose place in the runoff represented a "risk" for France. Allianz's El-Erian on CNBC - Most now assume Macron will be President; anti establishment wave may not be over.